Rent Giant LED Light Bright Game for your next bar bat mitzvah, corporate event, trade show, or other special event in the MD DC VA area. 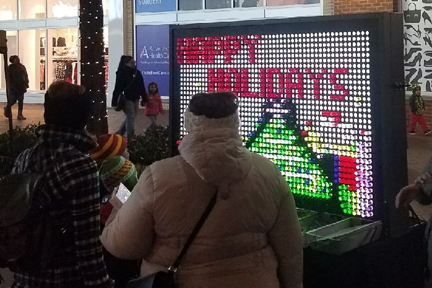 Giant LED Light Bright Board - Remember playing with your small toy version of this as a kid? You and your guests will love reminiscing and creating designs by placing translucent colored acrylic pegs in the giant 4'h x 6'w LED back-lit panel board. A fun, interactive experience for all ages! Great for displaying a logo or design and later turning into an interactive activity, too! Includes: Giant LED board, over 1000 different colored pegs (up to 8 colors), peg bins, (1) 8 foot table, table cover, and attendant.